Friendships come in many different forms and many different stages of life. You have childhood friends, high school friends, college friends, and lifelong friends. Childhood friends are the ones you grew up with and played with after school. You may have played little league together, been in the same girl scout or boy scout troop. High school friends are the ones that were there when you needed them. They were the ones that you had sleepovers with and went to football games with. College friends were the ones that you partied with on the weekends. You may have been in the same sorority or fraternity, dorm roommates, classmates, etc. These friends have the potential of becoming lifelong friends. The best kind of friends are the lifelong friends. These are the ones that start out in one stage of your life but continue to impact your life in other stages. Lifelong friends are rare gems. They are there for you when you need them and even when you don’t need them. They just seem to know that there’s something wrong and you need to talk! My best friend and I became friends in high school. The stage in life where you are trying to validate who you are and where you are going in life. We have had some rough times in our 18 year friendship, but we never let it get us down. We have had more joyful times that rough times in our lives! Those are the times we choose to remember! I know we will have many more to come! Have you ever felt like someone was put in your life for a reason? That’s what happened when we became friends. We both had some major life events happen and needed that extra boost of confidence. She had just moved to a new town at the same time she turned 16. My best friend from grade school had just moved away after getting into some trouble. It felt like God knew we needed each other! I had to tell you all that to actually get to this point! Haha! Don’t you love stories like that? Anyway, my best friend and I live 963 miles away. That’s a 14 hour 35 minute drive! So, it’s safe to say that we haven’t actually seen each other in person in ten years! Over the years, we have learned how to keep our friendship alive. It’s so much easier with social media and texting these days than it was before though. We use Facebook to share things with each other. We text on a somewhat regular basis! Sometimes we can go days or even a couple of weeks without replying to a text thinking we already did but actually didn’t! We have not talked on the phone in ten years. At this point if one of us called the other one would immediately think something was wrong! Haha! We keep our friendship alive in other ways beside social media. We have this small gift exchange called cupcake mail. We send small packages with things that we think the other one will like! We usually do bigger gifts for birthdays and Christmas. Cupcake mail got pushed aside while we were moving in April and I’m not even quite sure if I even sent anything for an Easter gift! 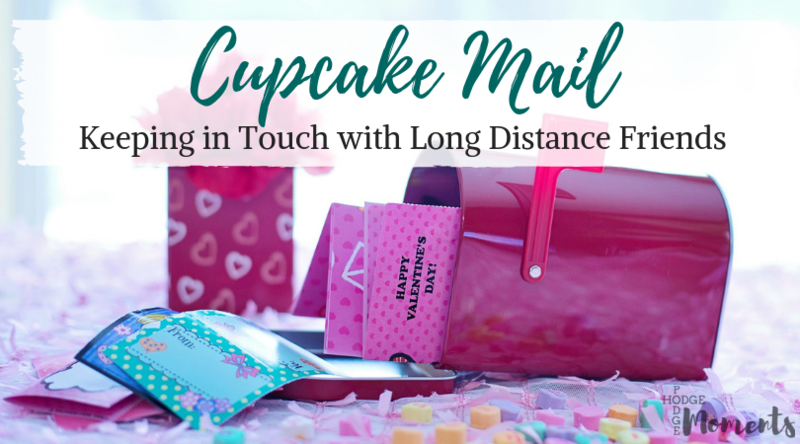 So I moved on to May cupcake mail and considered April’s gift a loss! Haha! Sometimes we lose track of if we have sent something, but that doesn’t mean we have given up! Life just happens to get in the way! Like the fact that she’s been busy with summer school and growing my nephew that’s due in November! Just because we don’t send every month doesn’t mean we are losing touch with each other. It just means that life happened! Find a gift that reminds you of your best friend. Wait to see what reminds your best friend sends you! We also send cards and just notes of encouragement to each other. 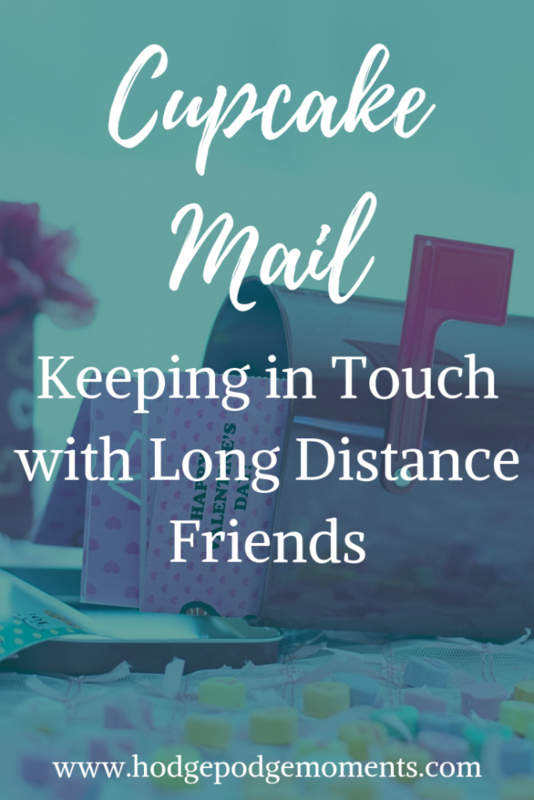 Do you have a long distance best friend? What do you do to keep in touch?